Fall is here and with it some marvelous nail polish colors. This year’s fall trends center around earthy hues and jewel tones. Replaced are the bright beach colors of summer by their more mature cousins. Where hot pink and coral used to grace every woman’s nail polish collection, now we’re bringing back oxblood and taupe. Our favorite lime greens and sky blues are replaced by intense emeralds and deep sea navies, both matte and glossy. And the great, larger-than-life glitters are forced in to retirement by metallic sheens and subtle, stardust sparkles. This week, I went on the hunt for the perfect Slytherin emerald. Wanting to try out Butter (and because it was on sale! 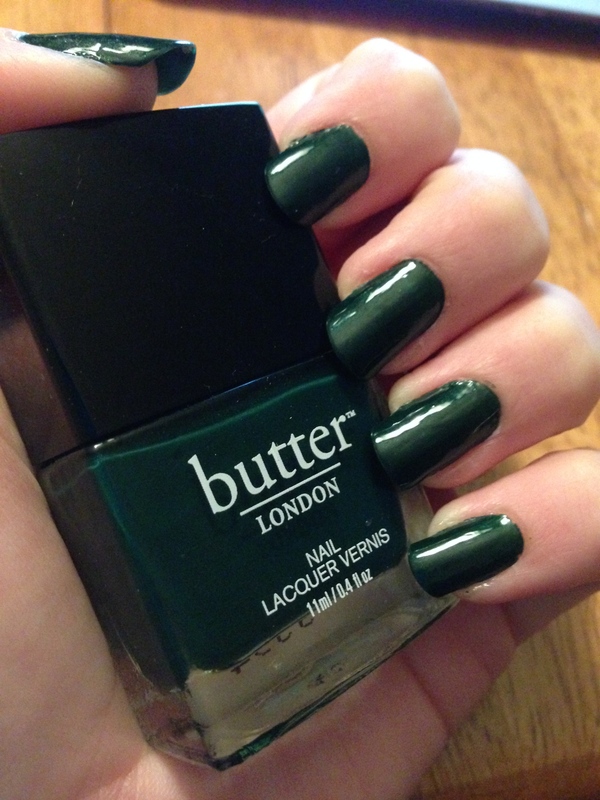 ), I chose “British Racing Green.” I started my regular process of removing old polish and cleaning the nail. I then applied two coats of OPI’s Original Nail Envy. (Why two coats? 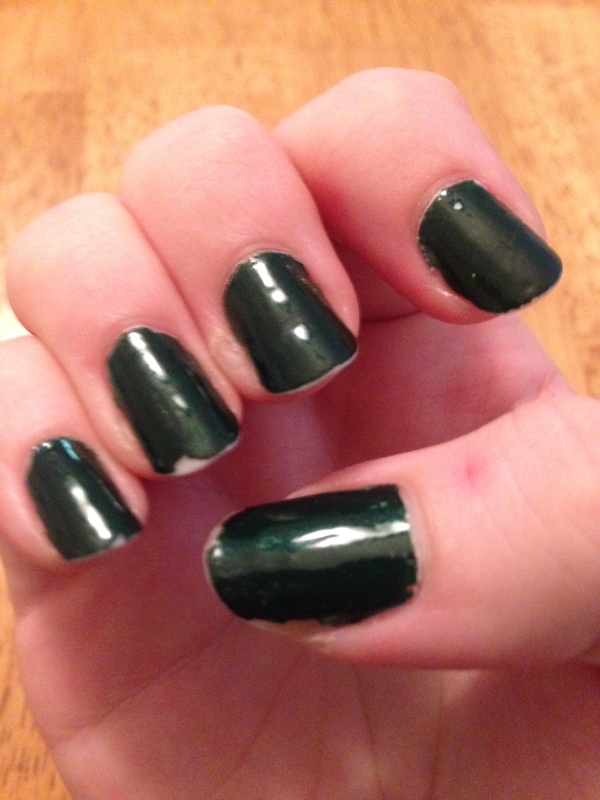 I have struggled with weak, brittle nails, so I do everything I can to make my nails stronger.) While my newborn was sleeping in the other room, I succeeded in applying two coats of my new Butter lacquer, but she woke up before I could slather on a top coat. 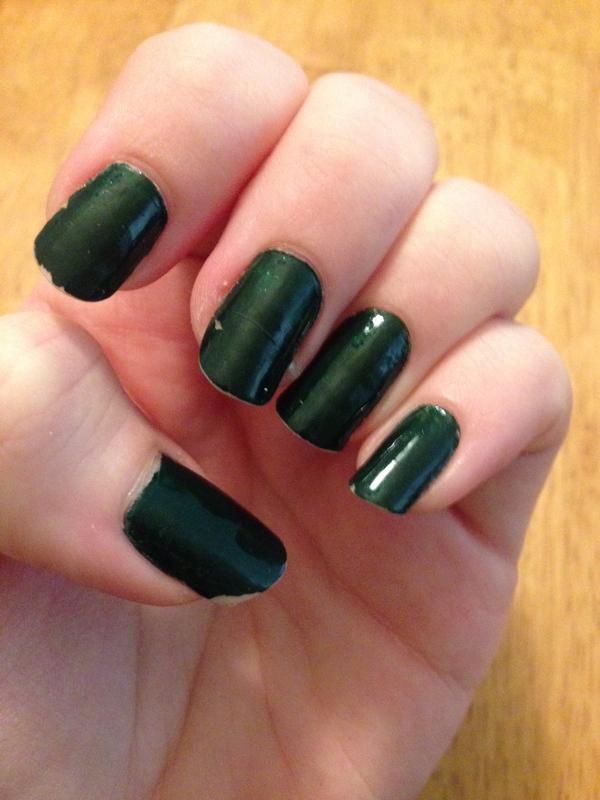 My nails went a full day without a top coat, so I applied some British Racing Green touchups before applying two coats of OPI’s RapiDry Top Coat. I’d like to give Butter another chance sometime because their colors are great, but my first impression of them was sad indeed. Leave a comment below with your thoughts and let me know what your experience with Butter has been!